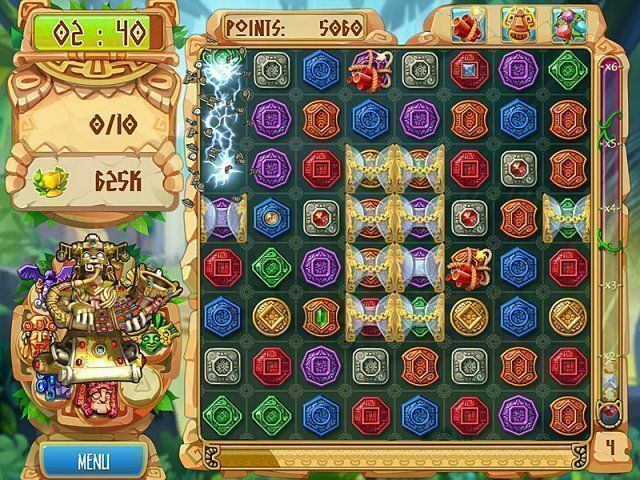 Here you can download the game “The Treasures of Montezuma 5” on your PC without registration and for free. To download the official version of the game on the computer is very simple, you can do this by clicking the button Download Game. You can get the key to the game “The Treasures of Montezuma 5” after starting the game by clicking the button Remove the time limit. Another expedition to the jungles of South America is planning to find countless treasures of the Inca emperor Montezuma! Join these brave explorers to get your share of world fame and satisfaction from making world-class discoveries! The expedition faces many obstacles on their journey, as the Incas were not only one of the most developed civilizations on the continent, but remarkable inventors as well! Their puzzles still boggle imagination, and it won’t be that easy to cope with them. 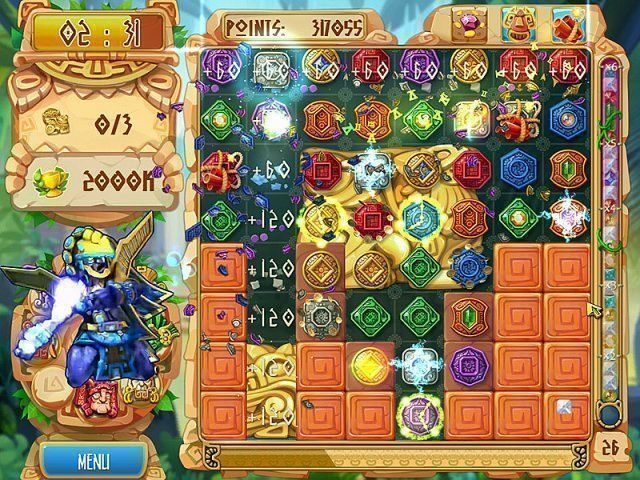 In order to move along the route, you have to collect a certain number of crystals. You can get them on the playing field, collecting chips of the same color, three or more in a row. Precious stones are attached to some chips — these stones are your main task. In some cases, however, the tasks will be more difficult: to find gold nuggets in the sand, find hidden treasures behind the stone slabs or collect unique insects. Ancient Indian gods will help you during the expedition. To bring them to your side, you have to prove that you really deserve their help. Besides you can use totems — magical artifacts that improve your characteristics. 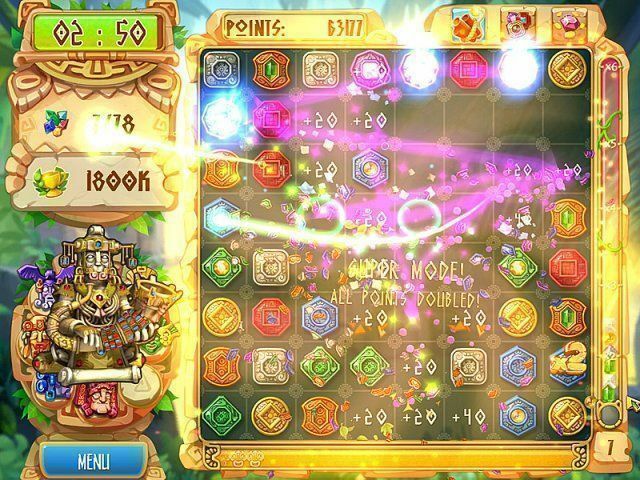 Collect crystals, perform additional tasks, and you will get a huge power that can considerably increase your skills in collecting treasures! Be ready that the expedition will be long and full of a wide variety of surprises. Pick up the totems for each level mindfully — depending on the task; some of them may be useless, and you just waste your crystals. 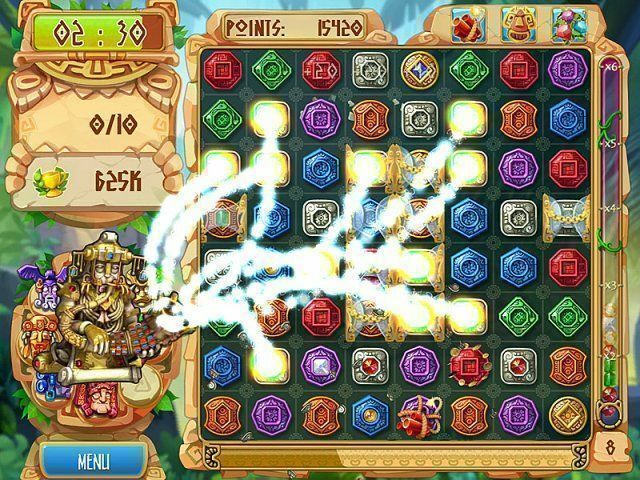 You will see impressive special effects, dynamic developments, breathtaking treasure-hunting and pleasant sounds and tunes — all those things that made the Montezuma game series a bestseller known on all continents of the planet! Match birds across dozens of levels!